Users on all sites will now be able to access their system using an iPad or an iPhone. 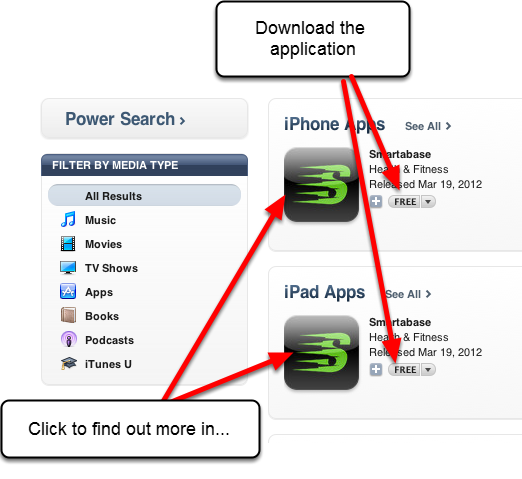 You can now download and access the Smartabase and Profilersports software from your iPad and/or iPhone. Go to the www.apple.com App store. Your system can now be accessed via an Apple iPad and/or iPhone application. The application name in the App store name is called "Smartabase"
Type in Smartabase into the search box on your iPad or iPhone App store search box. The Smartabase application will appear as a Green "S" Logo (as shown here). For all Users who access the software using Profilersports or Performance Profiler, you will be able to access your system through this Smartabase application. If you use an iPhone you will be able to download the iPhone Smartabase application. If you use an iPad you will be able to download the iPad Smartabase application. Click on the Smartabase logo to find out more information about the application. Or, click on the "Free" to download the software. -If you have an iPad download the iPad version. You will be required to login to your Apple account to download the software. 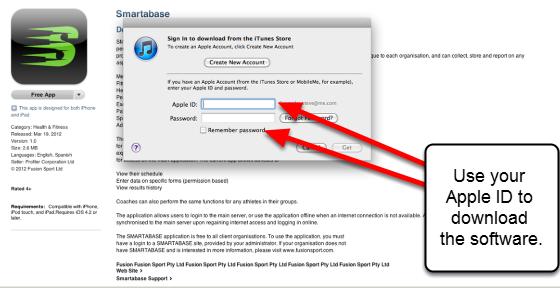 The example here shows the Smartabase application being download from the iTunes store. You need to enter in your APPLE ID and you Password to be able to download the software. DO NOT ENTER IN YOUR SMARTABASE USERNAME AND PASSWORD. You will need your Smartabase/Profilersports application name and username once the application has installed on your device. The application will install on your iPad or iPhone. Please wait while it installs as this may take some time. If you have any problems with the installation, contact your distributor.